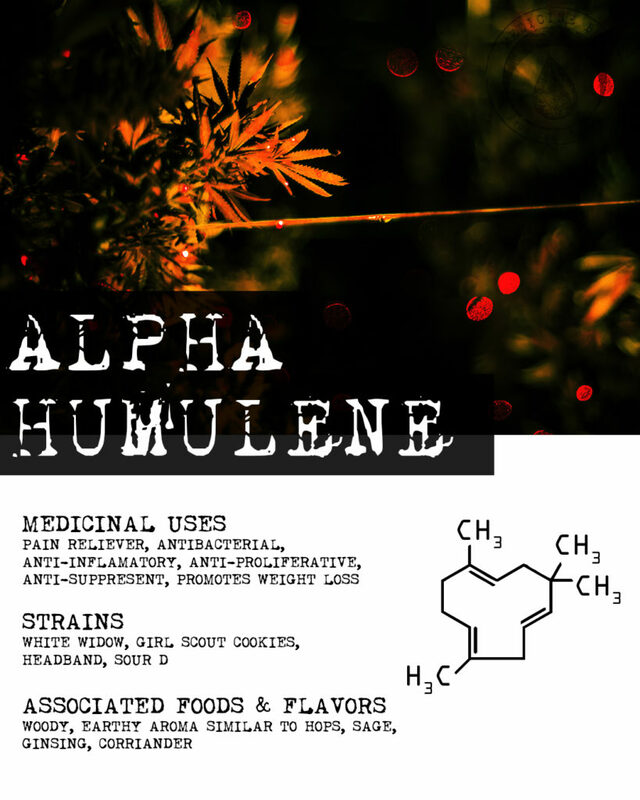 Alpha humulene, also known as alpha caryophyllene, has an earthy/woody scent. It’s found in hops, so it’s responsible for the distinctive smell of beer. Like many terpenes, it fights harmful insects, but it also has some interesting medical potential for humans. Most terpene research is still in the preliminary stage, which means scientists are testing rodents and Petri dishes instead of humans. It’s also important to remember that researchers almost never use smoking as a consumption method — oral, topical, and injected methods are all far more common. All of that means that terpenes have a wealth of medical potential, but we’re still learning exactly what they can do and how they do it. Helps reduce inflammation in the airway caused by allergic reactions. Shows antibacterial activity toward Staph. aureus. Prevents the growth of cancer cells. Works as an antioxidant and anti-inflammatory in diabetic tissues. This terpene is incredibly common in cannabis. Most strains contain some humulene and for many, it’s one of the top three most abundant terpenes in a given strain. That given, there are too many strains to list here — make sure you ask for test results if the terpene content of your cannabis is an important factor for you. We use ginger, peppermint, ginseng, sage and black pepper in our products. We hope that the combination of cannabis, terpenes, and functional food ingredients help our tribe manage pain and inflammation as they enjoy their lives. Cannabis is a powerful tool for wellness and terpenes are amazing in their own right. We’re excited to see the emerging research that verifies the healing power of not only cannabis but also the tiny components of cannabis like the individual terpenes.